The only game powered by the Internet! Based on the Funhaus show. 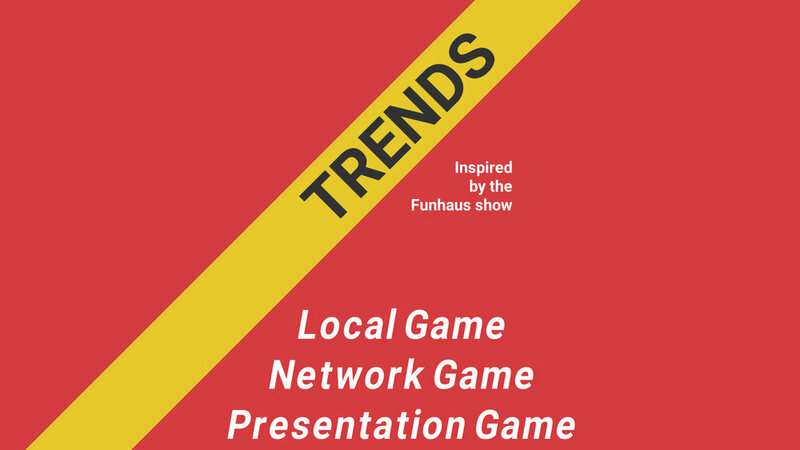 Trends is a game where you pit your knowledge of the Internet against your friends. The game chooses a word and you must pair it with your own to create a search term. Each player gains as many points as their term earned through the Google search engine. Local games allow you to play the game over an unlimited number of rounds with up to five players on a single device. Presentation mode can be used to pitch two teams against each-other with the help of a presenter. The presenter (or crew) control the pace of the game and input the team's words. Presentations can be pre-scripted. You can create a script using the rules below and load it into Presentation Mode when prompted. Each expressions must be on a separate line and the file must end with an end of line character. (LF or CR+LF) Later lines overwrite earlier lines. Properties are key-value pairs where the key and value are searated by the first equals sign (=) on the line. Objects are sections that contain collections of properties and flags. The entire file can be thought of as an object, whith multiple objects inside of it. The first line of the object is the object type. All the object's contents should be indented with a single space or tab. Title is the string that will be displayed on the banner when the game initially starts. TeamNamePrompt is the word that will be used as the prompt for the team names round. EndGameAfterLastTerm specifies whether or not to force the game to end after the last round. This can help the operator to remember to end the game at the right time. There is also an implicit TermList in which Term objects are described. Rounds will be in the order that the Term objects appear in the file. Term objects describe each round in the game. Prompt is the word that will be used as the prompt during the round. SuperTrendWord is the word that will award an extra 100 points during this round. The score for this round will be multiplied by Multiplier before being added to the team's score.